In the previous post, we looked at video resizing & cropping, renaming, trimming, deleting, concatenating, rotating, and creating rounding corners/circular videos. In this post, we’ll look at Transcoding videos, Quality control, Bit rate control, Video codec settings, Generating Video thumbnails, Adding image overlays, Adding Video Overlays, Adding text captions, and Adding subtitles. Transcoding is the direct conversion of one video encoding format to another. Videos can be uploaded to Cloudinary in a variety of formats: mp4, webm, flv, mov, ogv, 3gp, 3g2, wmv,mpeg, flv, mkv or avi. These formats may not necessarily be best suited for web and mobile usage, so these videos can be dynamically converted and normalized to the relevant web formats, and optimized for different web browsers and mobile devices. Transcoding the video to another format is done by simply specifying the new format as the file extension of the URL (client libraries can also use the format parameter to specify the new format). Cloudinary currently supports transcoding videos to one of the following output formats: MP4, OGV, FLV, WebM (see video_codec in the Video transformations reference table for the default settings for each format). Furthermore, video files can be converted to audio files by stipulating one of the following formats: MP3, OGG, WAV. cloudinary_url("dog", :resource_type => :video, :format => "webm"). where “dog” is the public_id of the video. It’s that simple!!! Let’s implement the functionality in our application. Here we have the current format of the video & an option to change the format to either ogv, flv or webm. * You can alternatively use the cloudinary method like so: cloudinary_url("dog", :resource_type => :video, :format => "webm"). We are actively changing the format of the video to the option selected on the frontend. Update the Video.update method to return the newformatVideoUrl as a json response. So we can use the formattedVideo scope variable in our edit_video.client.view.html . Control the video quality with the quality parameter (q in URLs). This parameter represents a mapping between the actual low-level settings of each different video format normalized to a quality value between 1 (lowest) and 100 (highest). 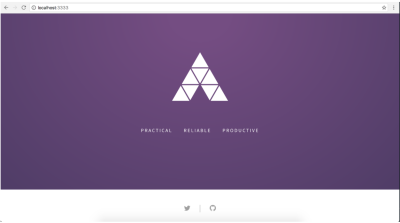 Reducing the quality is a tradeoff between visual quality and file size. See video_codec in the Video transformations reference table for the default settings for each format. A string supporting ‘k’ and ‘m’ (kilobits and megabits respectively) e.g. 500k or 2m. The video_codec parameter (vc in URLs) is used to determine the video codec, video profile and level to use in the form <codec>[:<profile>:[<level>]] e.g. vc_h264:baseline:3.1or vc_h264 or vc_h264:high. You can set this parameter to auto instead, to normalize and optimize the video for web (including audio settings). By default, any transformation applied to the video (e.g., resizing) implicitly also uses the auto settings when delivering the transformed video, so using the auto setting is only needed when delivering the same format as originally uploaded with optimization but without any additional transformations. See video_codec in the Video transformations reference table for the default settings for each format. 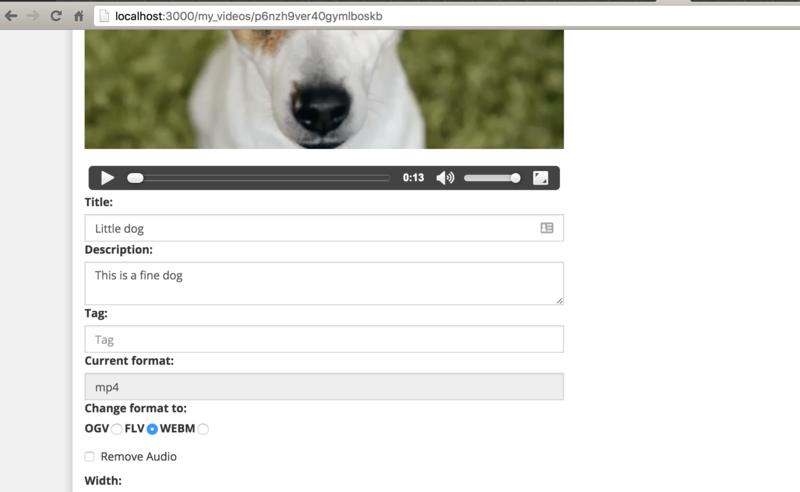 where dog.mp4 refers to the public_id of the video. You can easily generate image thumbnails of your videos. The goodness about this functionality is that you can actually generate image thumbnails of any frame within an uploaded video by simplifying the image format you need e.g jpg, png, webp, wdp. A float representing the time in seconds from the beginning of the video e.g. 5.44. A string representing the percentage of the video from the beginning. This string consists of a number with a p appended e.g. 35p (0p is the first frame and 100p is the last frame). The client libraries also support appending a % instead of a p.
A value of auto which automatically selects a frame that best matches the average value of a color distribution analysis of the first few seconds of the video, making it more likely to display a typical frame. Let’s see how this works in Yourtube. Remember, we already have an offset percentage option on the edit video form from the previous trimmed video functionality we built in a previous post. We’ll just use that as shown in the code above. Update the Video.update method to return the videoThumbnail as a json response. So we can use the generatedThumbnail scope variable in our edit_video.client.view.html . Now try it out, you should see the thumbnail generated based on the off_set percentage you chose! Add another video as an overlay over the container video by using the overlay video parameter (l_video: in URLs) and the public ID of a previously uploaded video (e.g. l_video:dog for a video with the public ID of dog). You can determine the dimension and position of the video overlay using the width, height, x, y and gravity parameters the same way as used for images (see Adding image overlays for more details). Furthermore, it is possible to control when the video overlay is displayed by using any combination of the 3 offset parameters (see Trimming videos for more information on the parameters and their possible values). The overlay can also be further manipulated like any other video uploaded to Cloudinary. Add a text caption over the video with the text: property of the overlay parameter ( l_text:in URLs), followed by the font name and size (separated with an underscore), a colon, and then the text string to display. Let’s see how this works in Yourtube!!! Update the Video.update method to return the captionedVideoUrl as a json response. So we can use the captionedVideo scope variable in our edit_video.client.view.html . Now try it out, you should see the text we put in the form show as an overlay on the video! You can add subtitles to videos from SRT files previously uploaded to Cloudinary as raw files with the subtitles: property of the overlay parameter ( l_subtitles: in URLs), followed by the SRT file name (including the .srt extension). Let’s talk about SRT files for a bit. Remember when you download movies from the internet and you need translations for the video, you go ahead to look for srt files in different languages. Aha!, it’s exactly the same type of SRT files we are focusing on here. A numeric counter identifying each sequential subtitle. The time that the subtitle should appear on the screen, followed by --> and the time it should disappear. A blank line containing no text, indicating the end of this subtitle. A very good scenario for this is building a video service where users can upload a Japanese video and also upload SRT files that can make that Japanese video have translations for English viewers to understand. Cloudinary makes this possible without breaking a sweat! In this post, we have looked at Transcoding videos, Quality control, Bit rate control, Video codec settings, Generating Video thumbnails, Adding image overlays, Adding Video Overlays, Adding text captions, and Adding subtitles. In the next post, we’ll look at Audio Frequency Control and tweaking alll sorts of Video Effects like noise, contrast, brightness, saturation, gamma and vignette.